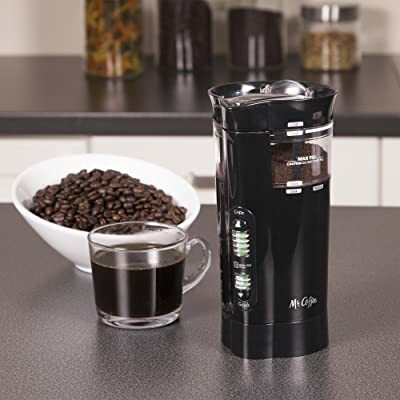 Now that you are in search for the best coffee grinder, you are surely aware that freshly ground coffee delivers the best cup of brewed coffee. Sure, you can always get pre-ground coffee beans – if you are willing to trade flavor and aroma for convenience. A true coffee lover should be willing to go through some trouble to make a perfect cup of coffee. 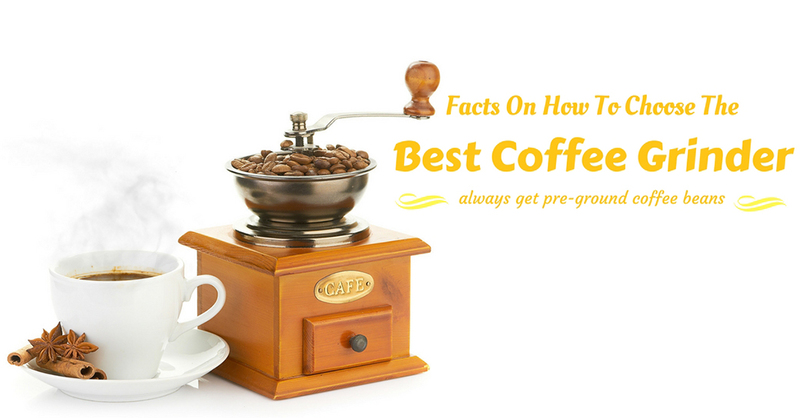 As a fellow coffee lover, I am here to help you choose the coffee grinder that’s best for you. 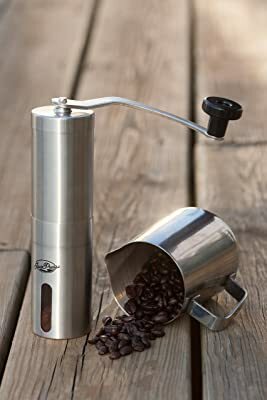 I will present you with the Top 10 coffee grinders today so that you can choose from some of the best options out there. Which is the Best Coffee Grinder for You? You need to understand the 3 types of coffee makers to determine the type of ground coffee you need. This information will help you determine the type of coffee grinder that’s most suitable to your needs. There are 2 kinds of coffee grinder. It’s important to know how each one works, as this will affect the quality of your brewed coffee. A blade grinder makes use of spinning blades to chop and slice up coffee beans. This method results in uneven coffee grounds as the spinning blades will hit and miss through the pieces of coffee beans. Instead of chopping and slicing (such as in the blade grinder), a conical burr grinder crushes and pulverizes coffee beans. The resulting ground coffee from this method will be even and consistent as everything is processed thoroughly. Note: Even consistency of coffee grounds is important in brewing coffee as this will preserve the character and quality of the coffee beans. Therefore, you get better tasting coffee by brewing even grounds of coffee. In the matter of blade grinder vs. conical burr grinder, it’s totally up to you to decide which one is more suitable to your needs. Speed – While a fast grinder can produce a lot of ground coffee sooner, the heat from the procedure can diminish the quality and flavor of the resulting coffee grounds. While there are many different levels of fineness and coarseness of coffee grounds, there are 4 basic types of grinds for making coffee. Coarse – Coarsely ground coffee beans have very distinct and large granules (similar to rock salt in appearance, but smaller). This type of ground coffee is used in making brewed coffee using a French Press. Very Fine – Very fine ground coffee will have the texture of the powder. It’s also called Turkish grind because it’s the consistency of ground coffee needed to make Turkish coffee. Before getting into our Top 10 countdown, I want you to know that you can choose from 2 types of coffee grinders – manual and automatic. Adjustable Grind Selection – You can choose from 18 coarseness control settings, anywhere from 1 to 18 (1 is fine and 18 is coarse). Operation – As a manual coffee grinder, there’s a hand crank mechanism that you need to turn to grind coffee beans. Capacity – A full load of coffee beans can grind coffee that’s good for 1 to 2 cups. Design – It’s ergonomically designed and slim, that it’s easy to hold. This model of a JavaPresse coffee grinder is good if you’re particularly looking for a manual type of grinder. Because you can accurately control the degree of fineness or coarseness of coffee grounds, you can use it to make different types of coffee – from French Press to Turkish coffee. The Kuissential coffee grinder is another manual coffee grinder. 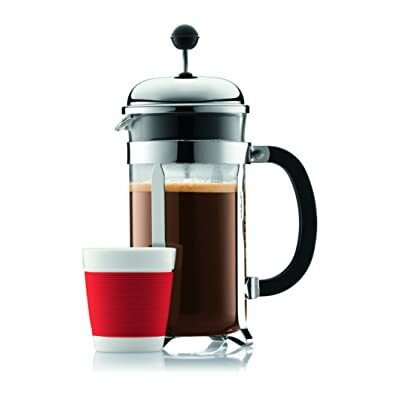 Like the JavaPresse model, it also uses the conical ceramic burr grinder. It’s available in the color black. 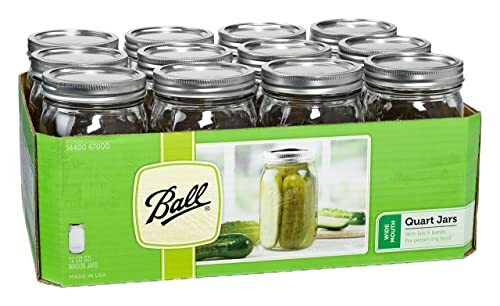 Materials and Build – It comes with a glass container with non-slip base. The bean hopper is made of BPA-free plastic. Operation – You need to manually turn the handle to grind coffee beans. There’s no static from the glass container after the grinding process. 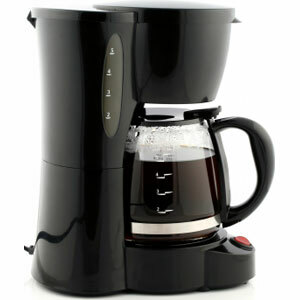 You need to remove the handle to adjust the dial that controls the size of ground coffee – which is quite troublesome. 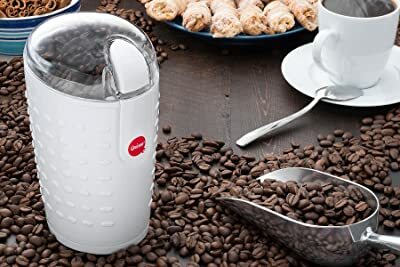 While the Kuissential coffee grinder is a nice manual coffee grinder, it’s quite troublesome to operate – especially if you need to adjust the size of ground coffee all the time. Also, it will take about a minute to produce enough grounds for 1 cup of coffee, so making a batch for 12 cups of coffee can really take some time (and effort). Stainless Steel Cup – The cup can be removed from the base to pour ground coffee into another container. 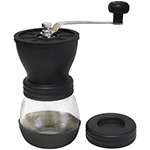 Clear Lid – You can see the process of grinding coffee as it happens. Since it comes with a very powerful motor, long pulses can actually burn the motor. 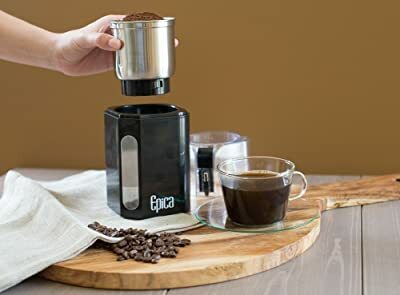 While this model of Epica coffee grinder is a fast, long presses can also lead to burnt motor. If you’re keen on getting this unit, make it a point to only press the activation button for about 3 seconds at a time. 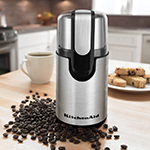 This KitchenAid BCG111OB coffee grinder is an automatic stainless steel blade grinder. You can get it in 3 different colors – stainless steel, brown, and red. Capacity – The bean hopper can hold 4 ounces of coffee beans and produce enough coffee grounds for 12 cups of coffee. Removable Stainless Steel Bowl – The bowl has markings (4,8,10,12) to indicate the number of coffee cups. Transparent Cover – You can see the consistency of coffee as it grinds. This KitchenAid coffee grinder may not be the perfect grinder, but it’s good enough to grind coffee beans that you can use for French Press (coarse). It’s not that consistent in making fine grounds of coffee for espresso. 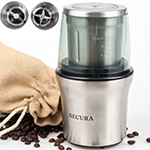 The Secura coffee grinder is an electric unit that uses stainless steel blades. It’s available in stainless steel color. 2 Stainless Steel Bowls – It comes with a grinder bowl for grinding coffee beans and spices and a chopper bowl for chopping nuts and vegetables. Overheat Protection – The motor is protected from overheating to ensure long life. Capacity – The grinding bowl can accommodate 1 cup of coffee beans. Operation – Pulse operation is done by pressing the button located at the top portion of the unit. 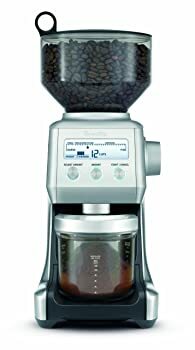 The Mr. Coffee IDS77 coffee grinder is automatic and it uses stainless steel blades mechanism. Should you decide to get this model, you can choose from 2 colors – black or white. Capacity – The bean hopper can hold about 9 tablespoons of coffee beans in one setting. This will result in ground coffee that’s good for making 4 to 12 cups of coffee. I like the programmable settings on this model of Mr. Coffee coffee grinder. It’s also quite fast – which is not always a good thing. At 450 rpm, the blades can produce heat that will affect the quality of the ground coffee. 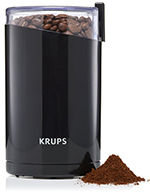 The Krups F203 coffee grinder is an electric model with stainless steel blades. It is only available in black color. Capacity – The bean hopper can accommodate 3 ounces of coffee beans and the result will be good for 12 cups of coffee. 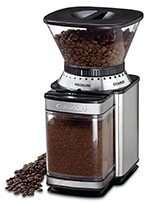 Multi-Purpose Grinder – This unit can chop and grind coffee, spices, grains, and nuts. 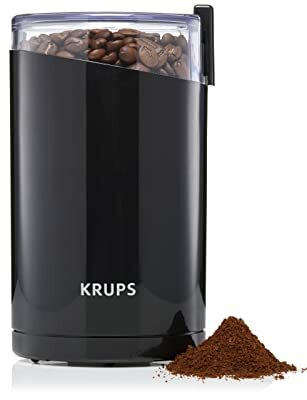 For a blade grinder, this Krups coffee grinder can produce ground coffee with good consistency. As you already know, consistency is very important in making delicious cups of coffee – that’s the reason why this model of Krups coffee grinder made it to the Top 4 position. The Cuisinart DBM-8 coffee grinder is an automatic burr grinder that uses a metal disk – so, it’s somewhere between a conical burr grinder and a blade grinder. This model is available in silver color. Adjustable Settings – There are 18 positions to choose from when setting the size of ground coffee (1 is fine and 18 is coarse). 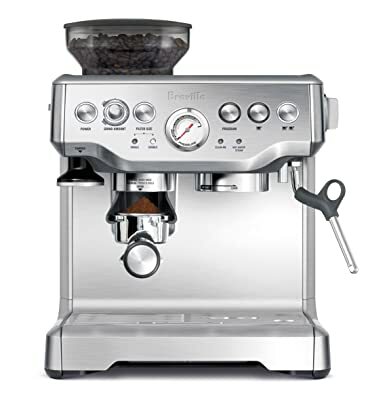 Control Settings – There’s a bar that you can slide to choose the amount of coffee to grind. Removable Parts – The bean hopper, grinding chamber, and grinding burr can all be removed for easy cleaning. Bean Hopper Capacity – The bean hopper can hold up to ½ pound of coffee beans. Coffee Chamber Capacity – The coffee chamber can hold ground coffee for 32 cups of coffee. It’s easy to set the size of ground coffee – just twist the hopper. It can make a lot of coffee in a short time (up to 32 cups). The package comes with a free coffee scoop and a cleaning brush. The many control options on this Cuisinart coffee grinder makes it quite impressive. The consistency of ground coffee may not be perfect, but it’s good enough. The many adjustable grinding settings will allow you to choose the consistency that’s most perfect for you. Transparent Cover – You can watch the coffee beans while grinding and check on the consistency of ground coffee. What really attracted me to this Quiseen coffee grinder is that it’s fast, efficient, and quiet. You can use this grinder to make ground coffee for your coffee maker. 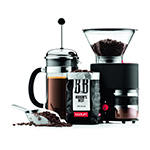 The Bodum Bistro coffee grinder is an automatic stainless steel conical burr grinder. You can choose from the following colors: black, white, red, green, copper, and chrome. Adjustable Grind Settings – There are 12 settings to choose from when making fine or coarse ground coffee. Timer – It comes with a timer that automatically shuts off after an operation. Push Button Control – There’s an on/ off switch to operate the unit. Glass Catcher – The glass bin can hold the ground coffee with no static. Guide Lid – The lid has a measuring guide that includes the recommended time and size for making coffee. Since there’s no static, transferring ground coffee is not messy. Since this Bodum coffee grinder is a conical burr grinder, it can produce consistent sizes of ground coffee – which is very important in brewing coffee. You can rely on it for your espresso needs (which makes use of finely ground coffee) as well as for making coffee with a French Press (which requires coarsely ground coffee). I highly recommend the Bodum coffee grinder because I believe it’s the best coffee grinder among all the products in our Top 10 list. 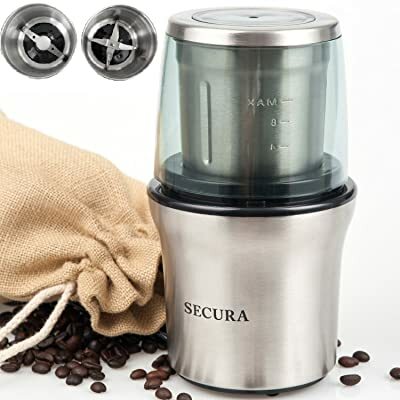 Since it’s a conical burr grinder, it can produce even grounds of coffee consistently. The glass container also gets rid of the static problem associated with plastic. You can even choose from many different colors if you get this model. As for the price – the price is very reasonable. If you’re specifically looking for a blade grinder, the Quiseen model is worth looking into. It’s cheap, and it operates at 150 watts (which is just right). 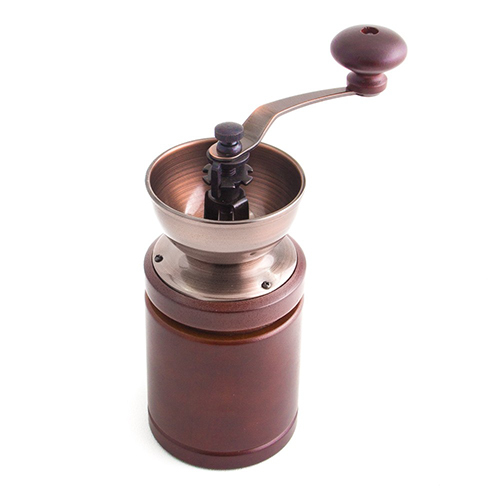 And although coffee grinders are usually noisy (video), this model is unusually quiet. The Cuisinart coffee grinder is good, too – if you want a model with a lot of programmable settings. But since it’s not a conical burr grinder, the resulting ground coffee may not be that even and consistent. Now, if you’re particularly looking for a manual type of coffee grinder, you can choose between the JavaPresse and Kuissential models. Since they are not electrically powered, prepare to grind coffee with some effort. The entire procedure is slow and quiet, but the resulting ground coffee will be even and consistent (almost perfect) – and therefore, flavorful. The manual coffee grinders presented in the Top 10 list are both conical burr grinders – so, they’re really good. Well, that’s it! I hope this article proved to be really helpful to you. Let me know your thoughts by leaving a comment below. And don’t forget to share this post with fellow coffee lovers who are also looking for the best coffee grinder.